My brother's birthday is this month, so I have been making this card for him. I am very please how it turned out. I wish my photography was as pretty as the card. One trick I learned from Mihaela was to use drywall tape (the mesh strip) that is self adhesive. Jon picked me up some at Lowe's and I used black soot distressed ink to color it. I love the texture. The embellishment says Love, but with the glare it is hard to see. 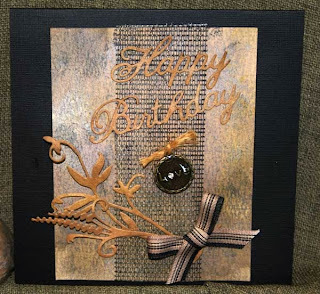 I love Tim Holtz's new water colored paper as it has distressed finish to it which gives you a beautiful distressed look. 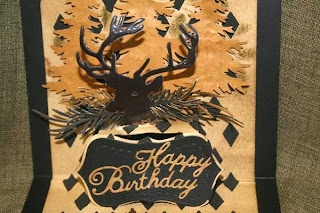 I used Frayed Burlap, Black Soot to color it by pressing the stamp pad on my craft mat and spritzing with water and then applied it to the paper. This was really fun to make. I first cut out the deer....not intentionally but it happened that I had my die turned the wrong way and it cut my eBosser Magnetic Shim. So, instead of throwing it away, I decided to use it for this card. I cut a slit on the "shelf" and glued the deer head in so that it pops up when my brother opens it. I had just received some of Wendy Vecchi's Stencils and black paste, so I stenciled the black diamonds on to paper that had been distress using Frayed Burlap Distressed Ink. After letting it dry, Wendy's ferns were stenciled onto the paper. Sprawling Fern was added behind the deer and 3 trees from Cottage Cutz were popped up behind the deer and fern. 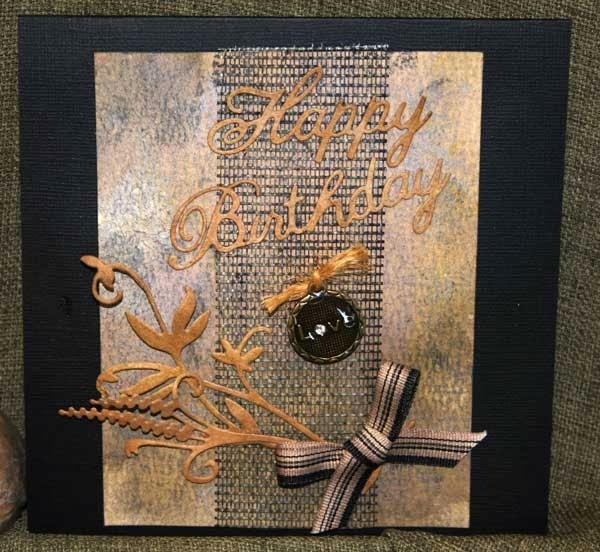 The flower and Happy Birthday was cut out and placed on one of Sizzix's new dies that has the stitching. Your card came out so well. 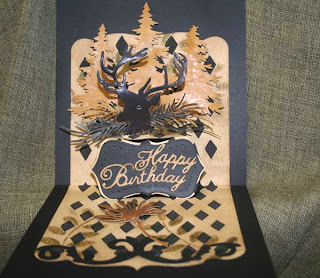 You used a lot of beautiful dies, so together made a very pretty card. Your brother will love it! Happy Birthday! This card really did turn out great - I love those techniques and all that goes into this card. I can't wait to try the drywall tape. Thanks for sharing. Your card is great! I forgot about the drywall tape technique (use & ink) I used several years ago. Thanks for bringing it to my attention (remember) again! Love the colors you used also~! Joan you nail this one, the finished cards is wonderful and so glad that I got to see some of it first hand. Your is beautiful and I hope to see you doing more. That is a very stunning and beautiful card. I will have to attempt to do this one similar to yours. Some brother will cherish it especially from his special sister. I got to see this card in the making...and it turned out beautifully...I struggle so with "man" cards...but this one is perfect!!! Love it all, especially the deer! What a great card - I love all the bits and pieces you used.